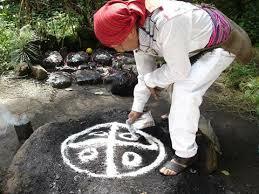 Visit the most sacred and holy locations around Lake Atitlan. Shaman priest perform Fire ceremony at sacred caves for healing, protection, safe travels, and for centering their energy. This is a once in a lifetime experience! The Lake Atitlan Shaman-Mayan Ceremony is held in three caves, Nimajay, San Simon, and Colorado that have been used by the Mayan for centuries to perform Fire Cleansing and Protection Ceremony. Mayans from many of the highland tribes travel for hours to visit these holy caves, and you will feel the energy and power when you approach the entrance to the caves. 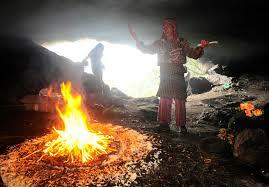 You will witness shamans performing ceremony on most days, although this is can not be guaranteed. You will feel honored to be a witness to ceremony that is a true part of the living Mayan culture of the Guatemala highlands. Your local guide will explain the significance of the ceremony, and will lead you on your own personal ceremony/meditation. The ancient Mayan civilization dates back over 5,000 years as evident by the ceremonial cities that still remain today such as Tikal and Chitchen Itza. Knowledge of the stars and their movements in relation to the earth are marked by the fact that their pyramids were build in alignment with celestial events. The modern day Fire Ceremony is how the Mayan of today connect with the old wisdom known as the Mayan Cosmovision. Performing a Fire Ceremony is an act of balancing one’s energy and intention in daily life. If we become out of balance out life is uncentered and causes havoc and instability. We must honor all components of life; good and bad, in order to remain balanced. Ceremonies can be focused on healing, protection, as a centering exercise, and for mediation. The ceremonies start with alignment to the cardinal points of the compass. The four cardinal points of the compass create a cross with each point representing a component of the Cosmovision; north for the sky, south for the earth, west for the past, and east for the future. The center of the cross represents the Tree of Life, and we should focus our life on being in the center of this universe. Building a ceremonial fire is a mediation on our mental state of mind and our physical acts. The mediation gives us time and space to reflect on our past and our future. Candles, with each color representing specific ideals. Each color can have more than one meaning, and the meaning is open to individual interpretation rather than one strict meaning. Flowers, incense, food, tobacco, and alcohol can be offered as gifts to the Gods to give them reason to listen to us. As the fire burns, our thoughts, prayers, and mediations are lifted up in the smoke to be carried to the heavens. Our negative energy is released, and our positive energy is empowered. During the ceremony, the shaman will give you candles. As you hold the candles put your thoughts, prayers, and intentions into the candles. When you place the candles into the fire, the energy is released to the heavens to be received by the gods. The caves are located 1200 ft. above Lake Atitlan, offering panoramic views of the lake and caldera. As you stand on the top of the Eagle Rock, the earth drops around you hundreds of feet below. You will feel you spirit soar like a bird as you stand with nothing but air on all sides.You can also visit the shine of San Simon / Maximon, and the colonial church. Low to medium impact activity. The locals explain their life philosophy as the Mayan Cosmovision. It is the culture’s attempt to explain and better understand all that surrounds it, including its place within the cosmos, or universe. In Mesoamerica, cosmovision was the most significant characteristic that influenced culture. Their understanding of the universe was guided by parallelisms, or dualities. One of the most fundamental dualities was that of macro cosmos, or the divine powers in the universe, and micro cosmos, life, as it exists on earth. Mesoamerican cosmovision linked space and time in a way that provided necessary structure to life.